Delicious squash bounty! Can you tell which is which? Welcome to the inaugural edition of Souper Bowl Sunday! That’s right, every Sunday I will delight you with a new soup recipe to help see you through the cold fall and winter months. I love fall. Mostly because I get to bring my beautiful leather boots out of storage and kick my way through piles of leaves, but also because the change of seasons means I can eat less salad and more soup! Soup may be my favourite thing in the world to make. It’s so easy and there is no end to the variations you can create. Basically if you have some veggies, seasoning, and water the world is your oyster! Since Thanksgiving just passed, the markets have been full of beautiful and amazing squashes of many varieties. 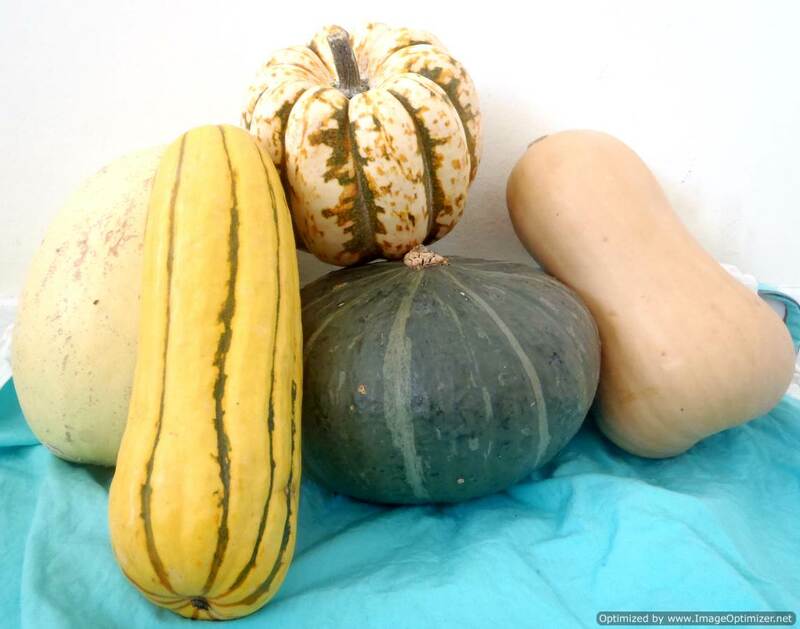 Yesterday I picked up butternut, buttercup, spaghetti, sweet potato, and sweet dumpling squashes. Now I’ve never cooked with the sweet potato, butter cup, or sweet dumpling squashes, so stay tuned for recipes featuring these new additions to my family. However, butternut squash is one of my favourite soup bases. Every time I’ve made this soup my friends and family have minor coronaries over how good it is (which are instantly healed thanks to the healthiness of my soup). 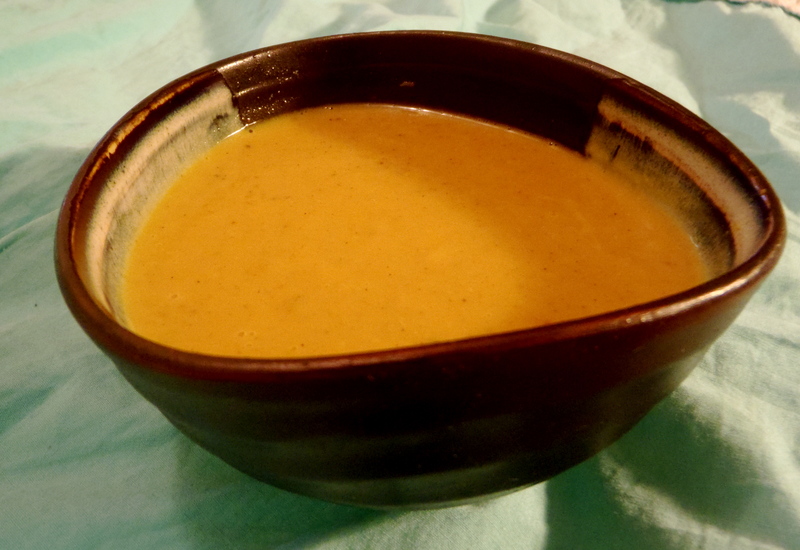 So today I’m going to share with you, dear readers, my spicy butternut squash soup recipe. You’re welcome, internet. Some of our ingredients for today. If you live in Toronto, I highly recommend buying Arvinda’s curry spices. Super fresh and no preservatives! As the name suggests, the base of this soup is butternut squash, which look like giant orange peanuts. The squash and carrots are a great source of beta-carotene, which can be converted to vitamin A-wesome in the liver and function as antioxidants in the body. Yahoo! They also have some potassium (remember that it functions in tandem with salt in order to manage your body’s fluids) and fibre to keep things moving along down the digestive highway. It wouldn’t be one of my recipes if it didn’t have garlic and onions in it. Both of these veggies are great sources of antioxidants and sulfur to help protect your body from free radicals. Not to mention they just add loads of deliciousness to any recipe, so I often use them as my base. Now instead of using cream to thicken our soup, we’re going to use my favourite dairy substitute, coconut milk. It adds lusciousness to pretty much any soup, without fear of the potential antibiotics or growth hormones found in conventional dairy. Not to mention a lot of folks out there are either lactose intolerant or allergic the proteins in dairy and we don’t want to exclude them from our deliciousity! Coconut milk also a great source of healthy saturated fats called medium chained triglycerides. These guys are preferentially burned as fuel, so they won’t be stored on your bootay. When buying coconut milk, you want to look for a brand that has as few added ingredients as possible. 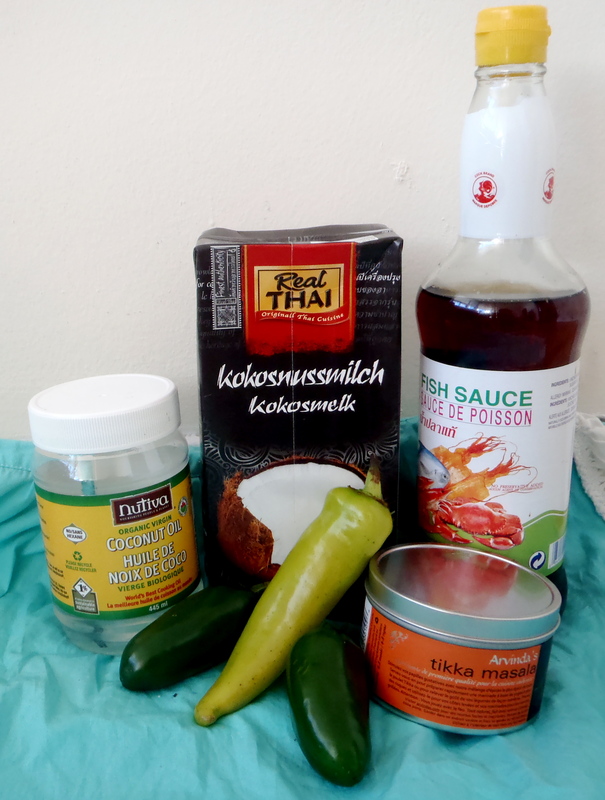 I’ve found two brands that are strictly coconut meat and water: Aroy-D, in the tetra pack, and Real Thai, also in a tetra pack. Finally, we’ve got curry powder, which is actually a mixture of many different spices, such as the bright yellow turmeric which provides us with an antioxidant and anti-inflammatory punch. Spices are typically great sources of antioxidants and other beneficial compounds, so I suggest getting to know your spice cabinet and adding as much spice as you can to your dishes. Remember to start out with small amounts and work your way up to your sweet spot. You can always add more spice, but it’s a lot more difficult to mellow out excessive spiciness. 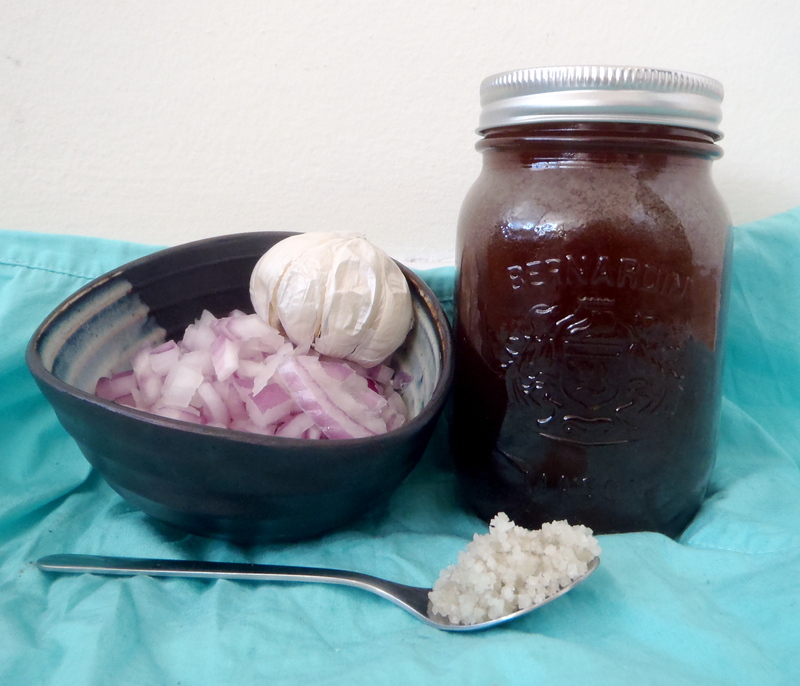 The rest of our ingredients: onions, garlic, sea salt, and homemade bone stock. Yum! Stay tuned for my quick and easy stock recipe. Add curry powder and oil of choice to a large pot. Simmer on low. Peel and rough chop garlic and onion. Add to pot. Simmer on low while chopping the rest of the vegetables. Cut all peppers in half, seed them, then rough chop and add to pot. Chop butternut squash into small cubes and add to pot. *Option* Cut the butternut squash in half, deseed it, and roast at 350C until skin is brown and puckers. Let cool and scoop out of the skin. Cut carrots into bite-sized rounds and add to pot. Add enough water or broth (quick and easy recipe coming soon!) to cover vegetables. Turn to medium heat and simmer for twenty minutes or until squash and carrots are fork tender. Remove from heat, add coconut milk, and puree with hand-held blender until smooth. For extra smoothness, press through a chinois strainer (basically a metal strainer with very fine holes). Options:Can replace the butternut squash with yams, sweet potatoes, or carrots or can do a combination of any of these four veggies. Tada! A souper bowl touchdown! This recipe makes enough to serve approximately 10, depending on tummy size and hunger. I like to portion it into 500ml mason jars and freeze the extra so I always have a quick and easy side dish ready to go. Thanks for joining me today folks! Let me know how this recipe works out for you in the comments. Happy eating! 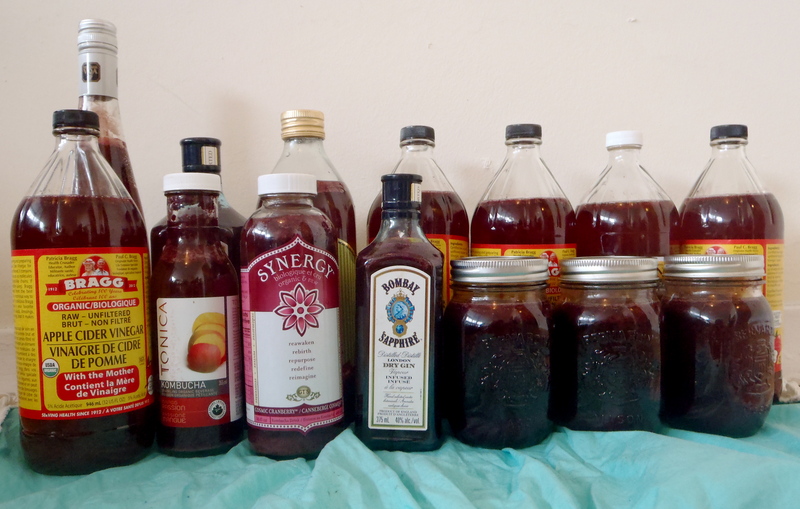 Fourteen bottles of kombucha may be more than I can drink in a week. Challenge, accepted! PS: Here’s the bounty I got from my first batch of kombucha. Somehow I don’t think I’m going to go through it all in a week. Mayhaps it can become a little side business, depending on how it turns out. Anyway, it’s a little dark because I added a blueberry puree rather than a juice to the bottles, but I still think it will be great. I also did half the bottles with a blueberry ginger mix because, well, that’s what I had in my fridge. One more day until the big reveal! Huzzah!